This has been a great decade for web typography so far. 2010 saw embedded font support reach critical mass among the major major browsers and developers can finally embed whatever font they want into any web page they want (as long as the font’s licenses allows it). After playing around with the technology for the past two years, I have done research on how to improve the look and legibility of @font-face type. Faux-bolding and faux-italicizing (i.e. “obliquing”) can be easily avoided a lot more easily with new browsers (and in some cases, even older IE!). Fonts that look horrible in Windows can be improved with autohinting. And best of all, advanced features of OpenType fonts, like ligatures, alternative glyphs, and other character variations are almost in all the major browsers (Safari, the only holdout, will have it later this year). Let’s see how we can put this all into practice today. See an “clean-room” HTML example page of the above faux-bolding in action. 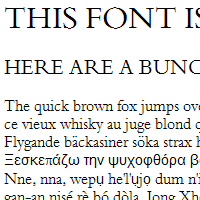 As I have mention in a previous article, Giving Challenged @font-face Fonts The Italics Makeover, browsers will also apply faux-italics (a.k.a. 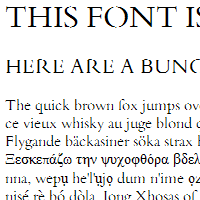 obliquing) to a font if it can’t find the real italic variant itself. What’s a developer to do? When you want to style text that is bolded, make sure to set the element’s font-weight to normal and set the font-family to the name of the bolded variant (in this case, "graublau_webbold"
This is a default hack that is used by services like Font Squirrel and my own CSS3 Font Converter shell script. The problem is, if the embedded font doesn’t load for some reason, the fallback font will not be bolded (which would be a bad thing in most circumstances). Older iPhones and iPads that are running iOS less than version 4.2 will crash when it comes across multiple declarations of the same font name. This can be avoided by removing the SVG version of the font in the declaration, since only iOS < 4.2 can only embed SVG fonts, which newer iOS devices can embed TrueType. This is a good trade-off, in my opinion, since David Smith and Apple themselves state that there are not too many people left who haven’t updated to a more recent version of the OS (less than 1%). IE8 and lower can only handle four declarations with the same name. If there are more than that, IE will ignore them. * by Zoltan Hawryluk (https://www.useragentman.com). The 400 and 700 weights correspond to normal and bold respectively. I use numeric weights instead of named ones because it allows my script to use up to nine different weights. For example, Exo is a font family that has nine weights, and the script is smart enough to take the individual font files and assign them the following CSS3 numeric weights for font-family: Exo. You can also do this with the Font Squirrel WebFont Generator, but you will have to check the “Style Link” checkbox. You may want to also ensure the SVG option is also unchecked (it is by default) so that your fonts don’t crash older iPhones. 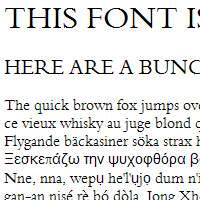 Note that this can only handle bold and italic variants of the fonts you upload — I tried uploading all the Exo fonts I listed above, and it didn’t handle all the the subtler weights (e.g. Light, Black, etc.) that my script does. A lot of fonts (especially a lot of free fonts) look just fine on a Mac, Linux box, or mobile phone, but look horrible on Windows. This is because Windows relies on the hinting information embedded inside a font, and these fonts may not be hinted correctly, if at all. For those who are new to typography, a font’s hinting information is a set of instructions that tells a device how to make a vector font look good on a pixel grid display. Since hinting is a very time-consuming process and takes a long time to learn how to do well, the result is a lot of ugly typography in Windows. This doesn’t happen on OSX, iOS or Android because these devices autohint the font — they ignore the hinting information inside a font and instead produce their own hints. While autohinting does not produce as good results as human-hinting, it still produces results which are way better bad hinting. The CSS3 Font Converter I mentioned earlier now has support for ttfautohint. It uses the autohinter used in Linux, FreeType, but you don’t need Linux to run it — ttfautohint runs on OSX, Windows and Linux equally well. Fontsquirrel’s Font Generator by default will also autohint your fonts (again, you can toggle this feature by going into the “Expert” tab again). You can see whole groups of horizontal pixels missing in the original font in Windows XP, which is especially noticable in the the lower-case t’s cross-bar in the word “autohinting”. This is because GDI Cleartype does horizontal antialiasing but not vertical. Even in IE9, the cross-bar in the letter ‘e’ is a little off. Note that nothing compares to a professional hinting a font by hand but in a pinch, autohinting can produce some descent results. Font Squirrel and ttfautohint have their pros and cons, and it really is a matter of trying both out to see which you prefer — you may even want to mix and match these two depending on the font, size and weight of the text you need to render on a web page. Keep in mind, however, that some font licenses don’t allow you to modify the fonts themselves, so please read the license that come with the fonts you download and purchase. The CSS3 font-feature-settings property gives me the flexibility with web typography that I have when I do calligraphy work. Take the example for the right. 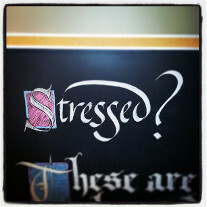 The two “S’s” in the word “Stressed” are different sizes, and the letter “d” has an ascender that stretches over all the lower case letters on the left of it (I would not normally write it this way, but it “looks good” in this context). These details make the lettering more interesting than if I decided to write letters the same way all the time. It is now possible to use font-feature-settings to create effects like these on the web, as long as the font and the browser supports it (currently, all the latest versions of the major browsers supports it, including IE10+). What are the possible values of font-feature-settings? 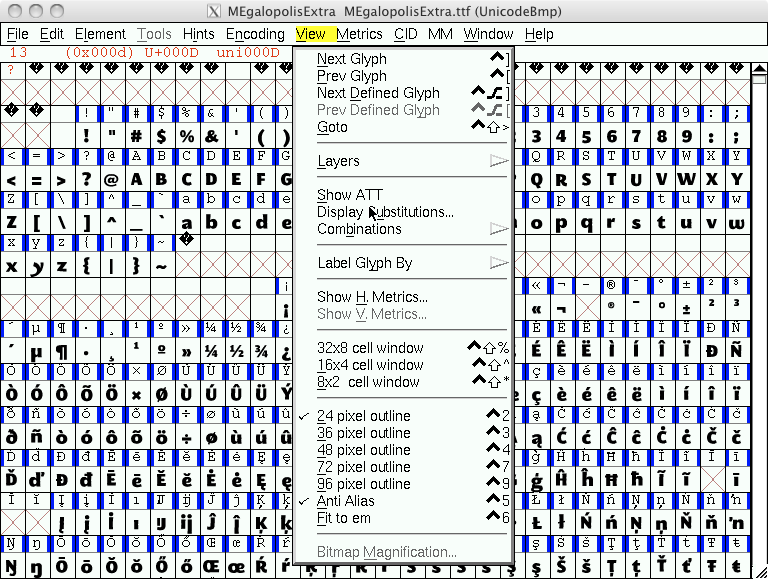 There can be a combination of any of the four letter font features supported by the OpenType specification. With them, you can add more variations than just bolding, italicizing and underlining can offer. These features are numerous (there are 135 of them), and typically a font will only support a few of them (if any). Let’s go through the more common ones. 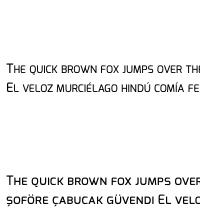 At the time this article was written (September 22, 2013) it appears that the Font Squirrel Webfont Generator strips out the OpenType Feature Tables from fonts when they are converted to TTF and WOFF. It does, however, allow you to work around this issue somewhat by giving you the ability to fold some (but not all) of these features in the default rendering of a font. While this works with less complex typographic needs, I hope an update is produced to implement feature tags using this excellent service. You can, however, use font-feature-settings with Google Fonts and fonts converted with my CSS3 Font Converter. 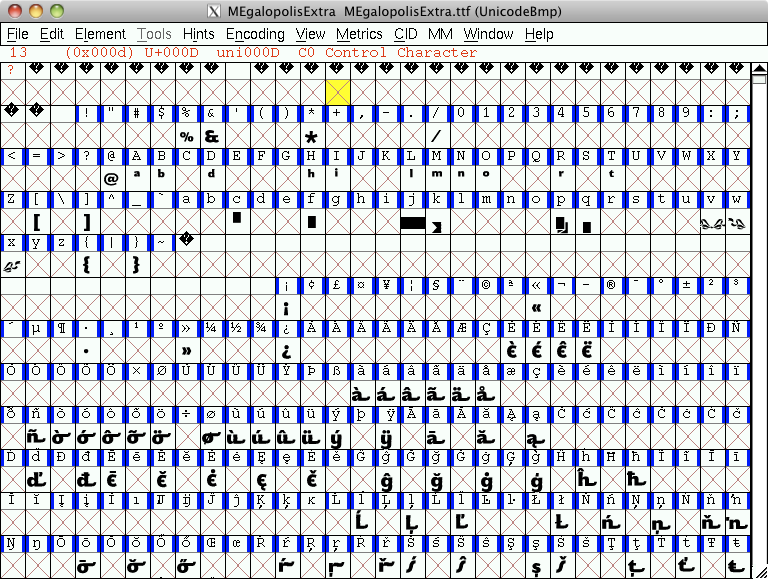 liga Standard Ligatures Usually produced for groups of characters that overlap each other. Common standard ligatures are the f-ligatures: fi, fl, and sometimes ff, ffi, and ffl. The example to the right is the “fi” ligature from Libre Baskerville. liga Discretionary Ligatures Ligatures that are decorative and to be used at the author’s discretion. For example, the ‘c’ and the ‘h’ together don’t overlap each other normally, but the Exo font has a discretionary ligature for them because it “looks cool”. hlig Historical Ligatures Ligatures that were in common use in the past, but are uncommon today. EB Garamond has a few of these that join letters like ‘s’ and ‘t’ with a curve coming out of the top of the ‘t’. frac Fractional Glyphs These are used for common fractional combinations so they don’t take up too much space on the page. The eample shown is ‘1/2’ in Libre Baskerville. 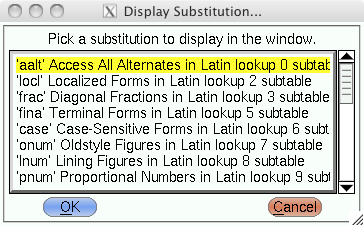 Note that not all fonts that implement this feature implement all the same fractional combinations. For example, Exo implements a Fractional Glyph for 1/7, but Libre Baskerville doesn’t. onum Old-Style Numbers These numbers are designed to blend-in with lower case text by giving them ascenders and descenders (like in the calligraphy example at the top of this page as well as in this example). Note that some fonts, especially revival fonts like Libre Garamond and EB Baskerville, have this as the default style for numerals, even though Adobe and Microsoft’s documentation state that this feature should be inactive by default. The example presented here is from Exo. tnum Tabular Figures These numbers are set to be fixed-width so that, if digits are lined up on top of each other, they line up. The example on the right shows this features as it appears in Exo. There are a few tags that lets the author choose an alternate form of a single glyph. swsh Swashes A swash is a typographical flourish on a glyph. These can include exaggerated serif, tails, mid-strokes, and so-on. The example to the right shows the difference between the regular and swash version of the capital letter “W” in EB Garamond. ss00 – ss20 Stylistic Set 1 – Stylistic Set 20 These tags are used for certain features of a font that may not be described accurately by an existing feature tag. What these features are will vary from font to font. The example to the right shows ss01 (rounded ‘E’), ss02 (slated ‘S’) and ss03 (script like ‘y’ and ‘g’) in the font Megalopolis. Note the OpenType small-caps are consistent on all browsers, while the font-variant: small-caps text looks quite different (and really bad in Chrome 29 — it looks like each small-cap-glyph is taking the width the “normal-sized” capital letters). Unfortunately, not all fonts implement the smcp feature tag (more on feature detection later), but when it is available, it usually yields better results. 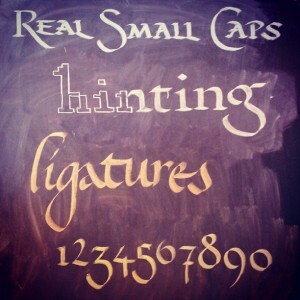 If you want more information on why true small caps are better than algorihmically generated ones, read Alec Julien’s Small Caps on i love typography. OpenType Layout tag registry on Microsoft.com. Note that 1 means on, 0 means off. Also note that some features may be active by default. For example, the OpenType documentation mentions that liga is recommended to be on by default. This doesn’t mean it always is — most have ligatures on by default, but some don’t. It is up to the creator of the font to decide what is on or off by default. This syntax is only valid for Firefox 14 and below. Since most copies of Firefox have auto-updated since then, I never use it. I mention it here for completeness. As mentioned before, what features are turned on or off varies from font to font (One feature tag, kern, is almost always on turned on by default, since it regulates the amount of space between pairs of characters). If you want to go back, just click View → Display Substitutions again. 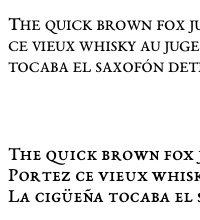 If you want to use some of these features using Google Web Fonts, you may need to ensure you choose an extended character set besides just Latin. 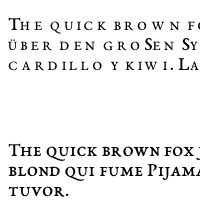 For example, for EB Garamond, I chose both Latin (latin) and Latin Extended (latin-ext) character sets. font-feature-settings doesn’t work currently with fonts converted with the Font Squirrel generator. 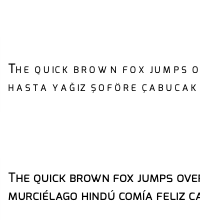 It does, however, allow you to fold some (but not all) of these features in the default rendering of a font. Better web typography with OpenType features by Ralf Herrmann via his blog (uses old Firefox syntax, but it is still a great article). WOW, WOW and pure WOW! :) What I see here is: we technically can bring all embedded font features we see in Adobe Photoshop (or other professional image processor) to the web. I am shocked. Thanks for such an AWESOME info Zoltan! @Shehi: Exactly. I’m surprised more people aren’t as excited as we are. It is pretty awesome that we now have so much control of type on the web. Don't be shy! Give feedback and join the discussion. Please Note: If you are asking for help using the information on this page or if you are reporting a bug with the code featured here, please include a URL that shows the problem you are experiencing along with the browser/version number/operating system combination where the issue manifests itself. Without this information, I may not be able to respond.